The origin of the Igbo people is a mystery and a subject of greater controversy, more controversial than that of every other ethnic group in Nigeria and probably in Africa. There are so many versions of Igbo origin and it is very difficult, or probably impossible to say which is the most real or most acceptable. Unlike the Yoruba’s which traces its origin to Oduduwa in Ile-Ife and the Hausa’s, which also traces its origin to Bayajidda in Daura, Igbo have no such historical identification with a founding father or founding home, many version claimed a different source which even made the Igbo origin more mystical. Although, it can be said that, most ethnic groups in Nigeria has more than one historical origin of their ethnic groups, but the historical origin of the Igbo ethnic group which occupy mostly the eastern part of Nigeria is far more mystical than every other. Study shows that, the Igbo people are best known for their segmentary or acephalous way of life. This is because, from the ancient times, they had no centralized states. Consequently, they operated a kind of government without kings. It has also been established that, the Igbo people are predominantly farmers and traders and despite some cultural diversity among them, they do share a common basic culture in their language with a cluster of dialects that are mutually intelligible. They also share a common political system based on decentralization of power and delegation of authority exercised by the holders of the staff of authority, the Ofo. Generally, Irrespective of which part of the above five categorization a group falls; they are certainly Igbo’s and would be regarded as such. As earlier stated, there are so many irreconcilable versions of Igbo origin; this has made it very difficult to ascertain which has gained more acceptances. Taking a brief view at some the various versions, we found the Israeli version to be more popular. The Israeli version has been established to be one of the most popular versions of the migratory stories of origin of the Igbo people. Israeli version is the one that points to Israel as the origin of Igbo. This assumption is based on the so-called similarities between the Cultures of the Igbo and the ancient Hebrew. Some Igbo scholars consider themselves as off-shoots of the lost tribes of the Hebrews who migrated southward. You should remember that the Igbo society has always been known as acephalous. Some believe that the Igbo peoples migrated to their present location from either the North or the Middle-east. Others believe that the Igbo people had been in their present abode from the beginning. Therefore, Igboland is the original homeland. Professor M.A. Onwuejeogwu (2000) regards the Nri version as the only authentic version of origin in existence in the oral tradition of the Igbo. According to Nri version, the ancestor of the Igbo, Eri, descended from the sky and sailed down the River Anambra. When he arrived at Aguleri, he met some autochthonous group of people who had no living memory of their own and settled with them. As their population increased, some groups migrated to other parts of Igbo land to establish their own settlements. This version is the second most populous version of the Igbo origin and it also explains why some Igbo view Anambra as the home and authentic origin of the Igbo. Some Igbo’s are also with the view that, for any Igbo man to excel to the extreme and assume the mantle of leadership of the Igbo race, such individual must hail from Anambra to gain legitimacy. Another tradition considered Awka or Orlu towns as the center of origin of the Igbo from where they dispersed to other areas. Some groups such as the Umunri claim to have migrated to their present location from Idah. The Onitsha and the Igbo on the other side of the River Niger [Delta Igbo], claim Benin origin. Moreover, there were very limited professional historians as at that period. There were no equivalents of Oba, and Alaafin or of Palaces over most parts of Igbo land. This is why it is very difficult to reconcile all these various versions. Unlike the Yoruba, which cohabit with the Igbo in the southern part of Nigeria and has only 2 version of its historical origin, Igbo’s had several irreconcilable versions. Yoruba only had 2 versions, the Rev. Samuel Johnson’s Version and the Oke Oramfe’s Version. Rev. Samuel Johnson’s Version In his book, History of the Yoruba (1950), Johnson was` said to have traced the origin of the Yoruba to the “East”. That the Yoruba came originally from the East, there cannot be the slightest doubt as their habits, manner and customs, etc., all go to prove. With them the East is Mecca and Mecca is the East. Having strong affinities with the east looming so largely in their imagination, everything that comes from the east with them comes from Mecca, and hence it is natural to present themselves as having hailed originally from that city. In the Oke Oramfe’s Version, it traces the origin of Yoruba to Oke Oramfe, which is located in Ile-Ife, in the present day Osun State. It is believed to be the centre from which the world was created. In their paper Yorubaland up to 1800, Akinjogbin & Ayandele (1980) give us a full picture of what Oke Oramfe’s version is all about. According to the legend, there was a period when the world was covered by water. The Almighty God then decided to send some of his messengers to the world and they included Obatala or Orisa Nla or Orisa Alase [as the leader] and sixteen Oye [immortals]. They were given fives pieces of iron, a lump of earth tied to a white piece of cloth, and a cockerel. Somewhere on their way to the world, the leader, Obatala, got drunk with palm wine. Oduduwa seized the symbol of authority from him and eventually led the party to the world. The site on which they landed is traditionally known as Oke Oramfe in Ile-Ife. On arrival at the site, Oduduwa set down the five pieces of iron and placed the lump of earth on them. The cockerel then spread its toes on the earth. Consequently, the earth was formed and Oduduwa thus became the ruler. It was from this base (Ife) that he extended his authorities to other Yoruba towns and villages. If we carefully observe the two version of the historical origin of the Yoruba’s, it would be observed that even though they are different, they have some similarities, which is Oduduwa and Ife. None of the two versions argues or dissociated Oduduwa from the origin of Yoruba. So, without any doubt whatsoever, the foundation of the Yoruba’s can be said to have started with Oduduwa as reconciled by both versions. However, the same cannot be said about the several version of the historical origin of the Igbo’s. 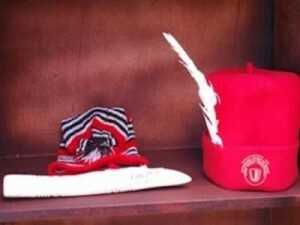 It is worth to note that, with the increasing civilization in Nigeria, especially among the Igbo’s, one would expect that the scholars and academia of Igbo extraction would engage in an all-inclusive research to truly find a connection between all this versions and come up with an authentic origin of Igbo ethnic group, but alas, nothing has been presented so far. In Conclusion, Let me states that, the only way forward for a people is the knowledge of their past, as this would assist them understand their present and as well as help them fashion out a way forward for their future. But, with the mystery surrounding the origin of the Igbo’s, it is my candid opinion that the Igbo ethnic group would find it hard to match forward without discovering its real origin. AMB Abdulrazaq O Hamzat is a Transformational speaker.